Sports-Fitness-Solutions Newsletter, Issue #022--HOW TO ENJOY THE HOLIDAYS AND NOT GAIN A POUND! HOW TO ENJOY THE HOLIDAYS AND NOT GAIN A POUND! The holidays are just around the corner and I know what you’re thinking. “I don’t care I’m going to eat and have a great time, and I’ll worry about those added pounds in January.” Well guess what I agree with you, you should enjoy all of the great foods that come with the holidays. The trick is to limit what you eat, and I have a couple of ideas to help you “have your cake and eat it too.” Take a look a few simple ideas that aren’t very hard to do and that really work. Eat a sensible meal before the party. Arrive at your party or get together with a full stomach. This will allow you to choose only those great foods that you really enjoy, rather than “grazing” on everything you see. Bring a favorite healthy dish to share. This will give you a healthy option to enjoy if you find no other choices. Your hostess and host will love the thoughtful gesture, and you’ll have at least one healthy choice. Alcoholic beverages and sweet holiday drinks are concentrated with calories. Unfortunately these calories don't fill your stomach so you're able to not only have these tasty beverages you’re also able to load up on other tasty high calorie treats. That’s a bad combination. So stick to drinking water, you’ll stay hydrated and not gain an extra pound. Don’t fill your plate more than once. I love to eat good food, especially at holiday time. There are treats that I simply cannot resist. So I’m never going to tell you not to eat at a party. Go for it, but only do it once. If you have a sensible meal before the party you’ll find that this is not as difficult as it sounds. So go ahead eat, enjoy, but only one plate. Taste dessert; take only small samples of your favorites. Desserts and sweet treats are one of the greatest parts of any holiday party. So again go for it; but only take a taste. Think of each dessert as a fine wine, they are to be savored not gulped. So savor a small taste of your favorite dessert or two. It’s not as hard as you may be thinking. Remember if you follow the plan: you’ve already eaten a healthy meal before the party, you’ve eaten only one plate at the party, so a taste of dessert works out just fine. So there it is, HOW TO ENJOY THE HOLIDAYS AND NOT GAIN A POUND! 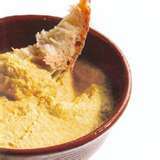 I found this great hummus recipe for the holidays and I hope you enjoy it. The red and green speckles give this hummus a great holiday look, and it tastes even better. Give it a try, it's easy to make and perfect to bring to a party along with some whole grain pita bread or fresh cut veggie sticks. It serves 12. To make, simply put all of the ingredients into a food processor and combine until smooth. Enjoy! One serving equals: 55 calories, 2g fat, 6g carbohydrate, 2g fiber, and 2g protein.